Herbert W. Houghton married Anna (?) in circa 1897 age 44; mar 3 y in 1900; mar 13 y in 1910 census. Anna (?) married Herbert W. Houghton, son of Augustus E. Houghton and Louisa Kelton, in circa 1897 age 44; mar 3 y in 1900; mar 13 y in 1910 census. Irene E. Robinson married Frederick E. Houghton, son of Alfred Houghton and Sally Silsbee, in Jun 4, 1884 date by JWH; mar 16 y in 1900 census. Lucy A. Jacobs married Irving B. Houghton, son of Benjamin Wheelock Houghton and Mary Ann Tyler, in Jun 11, 1864 at Guilford, Windham Co., VT, USA, he age 21. 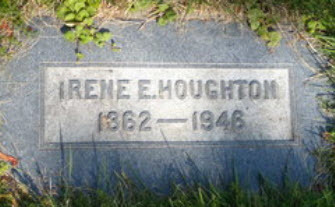 Edith L. Houghton married (?) Cook. (?) Cook married Edith L. Houghton, daughter of Irving B. Houghton and Lucy A. Jacobs. Jacob H. Houghton married Emma S. (?) in circa 1870 mar 30 y in 1900; mar 42 y in 1910 census. Emma S. (?) married Jacob H. Houghton in circa 1870 mar 30 y in 1900; mar 42 y in 1910 census. Charles Henry Houghton married Katherine (?) in circa 1909 mar 1 y in 1910 census. James Houghton married Sara A. Owen in circa 1884 mar 16 y in 1900; mar 26 y in 1910 census. Sara A. Owen married James Houghton in circa 1884 mar 16 y in 1900; mar 26 y in 1910 census. James Houghton Jr married Myra B. (?) in circa 1913 he 19, she 18. James Houghton married Emily (?) in circa 1886 mar 14 years in 1900 census. Emily (?) married James Houghton in circa 1886 mar 14 years in 1900 census. James Houghton married Bridget (?) in circa 1882 mar 18 y in 1900. Bridget (?) married James Houghton in circa 1882 mar 18 y in 1900. James Houghton married Margaret Crossin in circa 1892 mar 8 years in 1900 census.